New Camera. Max Brings an Oriole to the Nest. On Modes of Prey Attack. First, a note. My new camera came in yesterday, so these are my first pictures using it. Man, what a great camera! Can’t wait to learn to use it effectively. I did my regular circuits around the block and the top of the garage today. On top of the garage, by the stairwell, I found a bloodied pile of Mourning Dove feathers. I could see the rest of the pile up above me. Hercules flew in from the east about 15 minutes after I arrived with something in her beak. She dropped too quickly into the nest for me to see what it was. James, the security guard, came up to visit and told me that he’d seen one of the adults chasing “black birds” on top of the garage a little while before I arrived. He said the black birds escaped down a narrow opening between the two buildings to the north. We chatted for a few moments and then James headed out to do some securing of things. About 5 minutes later, Max swooped down from the northern skyscraper chasing a bird. I got a flash of bright gold, so considering what they’ve been eating, I’d say maybe an oriole. What followed was a high-paced, zig-zagging pursuit where Max stayed about 8 inches behind the little bird but could never catch up. Finally, he gave up and flew to the south, towards Printer’s Row. Within 8 minutes, he came back with another oriole, which he took immediately to the nest. 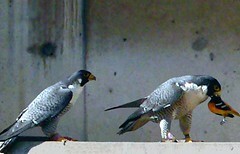 On Modes of Prey Attack – There are several modes of attack peregrines use to catch prey. I’ve seen several by this point, which is cool, but by far, the most common I’ve seen is the stoop attack. Stoop Attack: The falcon dives from above the quarry, wings generally folded tight against the body. The falcon pulls out of the dive above the prey, striking it at great velocity. The falcon curls its front talons so that they strike the prey with the knuckles. The back talon hangs lower, which allows for gouging and cutting. Smaller prey generally dies on impact. Larger prey (about the falcons size or a little bigger) is sometimes only stunned. 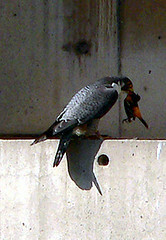 After the impact, the bird falls and the peregrine stoops again to catch it. Ringing Up Attack: Used on quarry initially flying higher than the falcon. The falcon gains altitude by flying upward in a spiral around the fleeing prey. Then, when above it, the falcon performs a series of shallow stoops to wound and exhaust the prey. Direct Pursuit: Often used when the stoop is unsuccessful. The prey flees by flying straight away. The falcon follows directly behind (tail-chasing) in powered, flapping flight in an attempt to overtake and grab the prey. This is what I saw Max do today. Contour Hugging: A type of direct pursuit where the falcon flies low, using the terrain to conceal its presence until it is right on top of the prey. This is a surprise attack. Shepherding: This is an attack used on flocking birds. The falcon herds a flock and harries the outer members until one panicked bird breaks formation and is vulnerable. I’ve seen both birds do this with pigeons, particularly. Attack on the Ground: The falcon lands and runs/hops/flaps after something on the ground. This is mostly used on prey which the falcon has hit in a stoop attack and missed catching. Also used on newly fledged or downy young birds. There are reports of the occasional kill of an invertebrate or small mammal in this manner, but it seems rare. Interesting to see this pair use a number of these techniques to catch prey birds. ~ by Steph on May 17, 2006.